The 19th Viva Festival opened on the 8th March to the themes of guerrilla warfare re-enacted on the car park of an American DIY store and the tragi-comedy of a botched jewel robbery in Madrid in the 1950’s. Humour starts the festival but rapidly turns into a much darker side. Atraco (Hold Up) is a crazy comedy set in Franco’s Spain in the 1950s drawing on cine-noir and Hollywood traditions as well as Mario Monicelli’s 1958 Italian crime caper “I soliti ignoti” according to the festival programme. The plot revolves round a loyal Peronist who wants to support his leader’s life in exile by pawning the jewels of the late Evita of “Don’t Cry for Argentina” fame. For the most part this is a light hearted romp which recreates the atmosphere of a forgotten Madrid under the dictatorship of Franco. There is plenty of room for comedy, and whilst the jewels are in the possession of the jewellers in Madrid, the wife of Franco is tipped off of their exceptional attraction. Franco’s wife was notorious for visiting expensive shops and leaving with luxury goods which she never paid for - the jewellers of Madrid actually organised a collective compensation fund amongst themselves to protect their businesses against such an outcome. It becomes imperative to recover Evita’s jewels before Franco’s wife does, and the plot unfolds with its unlikely comic duo, the henchman/bodyguard of the loyal Peronist and a young man who is befriended by the Peronist who uses his influence to find work in a local vaudeville troupe in Panama. This improbable pairing of the henchman and the would-be young actor are chosen as the two to perform the mission of the fake heist (to rescue Evita’s jewels) in which the jeweller is complicit. These details give a flavour of the confusion – the young man is bumbling, inept, a parody of a serious actor and certainly no professional robber. The bodyguard appears competent but descends into the same kind of farcical antics as his companion. This has a few hints of Laurel and Hardy in its execution. Meanwhile, the Peronist awaits news in Panama as they are sent to undertake the robbery. There is romantic interest in the form of a nurse who helps the Peronist when he has an asthma attack on exiting the jeweller’s after depositing Evita’s jewels and who then undertakes a dangerous liaison with the young actor when they arrive in Madrid to commit the hold-up. This turns out to be fatal for both robbers as the hold-up is botched. The henchman is shot in the process and wounded. They manage to escape to the country retreat of the jeweller (who is their slient accomplice) where they have been plotting the heist. The young man (who turns out to be the son of the Peronist trying to impress his long forgotten father) cannot resist seeing the nurse once more which leads to their capture and imprisonment as the police are on to them. An apparently safe escape in a refuge wagon is arranged through a contact of the Peronist in the Madrid government only for them to be deposited in a wood and mown down by machine guns. The dark ending rather undermines the comedy - this is the least substantial of the three films in this review. It entertains at times but fails to make us reflect as we are distanced by this period piece which does not hit us directly. A Puerta Fria (Cold Call) is set in the Spain of today, fully centred in its profound economic crisis. The Viva programme here quotes Jonathan Holland from “Variety” placing it in the tradition of all corrupt salesmen from Arthur Miller’s famous play onwards. Holland highlights “one man’s swift moral decline over the course of 36 hours”. There is a moral decline but this sales conference condenses what has been implicit or explicit in commercial relationships for many decades. The corruption is systemic not just individual as in Miller’s play. The rivalry, the male dominated hierarchy, transactional relationships, the consumption of vast quantities of alcohol, failed marriages, human values subordinated to financial targets, human beings treated as commodities - all these are part of the fabric of the annual sales convention. When times are good, the pattern of self-interest and reciprocal deals can sustain itself. However, that is based on the assumption that a network of commercial relationships will continue. The fate that awaits the unsuccessful rep is that of having to work “a puerta fria”, cold calling on a commission only basis, selling inferior products and facing almost certain financial ruin. The collapse of the Spanish economy through the financial crash and the implosion of the property bubble have precipitated this. Almost all the old regulars from the sales forces of the past have disappeared. The corruption and indeed inanity of corporate life are brought into debauched focus - the party has long been over but the hangover is permanent, no matter how much alcohol is drunk to drown the pain of failure. Antonio Dechent plays the desperate salesman who knows that unless he produces a raft of orders at the conference, he is finished. Maria Valverde is cast in the role of a very attractive promotions girl contracted by an agency for the conference. The increasingly entwined relationship between the two is the central strand which twists and turns through the plot. The salesman speaks little English, the promotions girl is fluent. All the salesman’s hopes of avoiding a sacking are based on landing the giant of all orders from an American company whose ageing representative speaks no Spanish. Enter the girl into the drama as she becomes drawn into the plot as a honey trap for the American. To close the deal and secure this enormous order, the American makes it blatantly obvious that a night with the girl is the missing offer. The salesman will not agree to such a condition but the girl out of loyalty to her relationship with the salesman which has formed over 36 hours, is non-sexual and based on the need to survive financially, decides to act. The ending in which the girl is seen knocking on the American’s hotel room door to “close” the deal is both shocking and shattering. The corporate world is seen at its most raw and brutal. Yet there is an implied continuity beyond this moral nadir. One also wants to know whether this conclusion was enough to ensure the salesman’s survival and indeed how the girl will develop in this environment of sullied competition. The film is well made and asks serious questions about the relationship between business and society and the vacuity of the moral order this reveals. Las Buenas Hierbas has a stereotypical South American style and pace, a total contrast to Hollywood movies of action with their continually mounting tension and the happy or optimistic ending. We are presented with all the colours and images of a vibrant Mexico City. To understand this style and develop an affinity with it, one has to become absorbed in the settings and the atmosphere, follow its human life, its comedy and tragedy, and become enveloped in its un-accelerated and unpretentious rhythms. The central theme here is one that touches all Western countries with ageing populations - that awful condition, Alzheimer’s, and its early onset in this case. The film pivots on the relationship between mother and daughter as the mother experiences the devastating consequences of Alzheimer’s. The confused anger and frustration of the daughter mounts internally at the loss of her mother’s personality as she cannot understand the frightening whimsy of her mother’s sudden changes as she switches from lucidity to terrified frenzy. In the end, unable to hand over her mother to the cruel care of a hospital, she smothers her with a pillow. Euthanasia is currently fiercely debated in British society but the backdrop to this movie is just as important as the fundamental theme. This is a film about loss of identity, of the disintegration of family relationships, its sorrow, its suffering and its reaffirmation of humanity. The mother is a herbalist with detailed knowledge of herbal medicines and plants with which the narrative of the film is interspersed. The daughter also works as a volunteer for a free local radio station. In fact the film has a much more pervasive meaning encompassing Mexico City and Mexico itself. There is a suggestion that in the modernisation of the country and the city, Mexican identity is being lost and traditional knowledge and wisdom eradicated by modernity. So the mother could in one sense be said to stand for a national examination of Mexican identity. Las Buenas Hierbas is long and draws the audience into its internal journey which is well worth travelling. Another Mexican poses and even greater challenge to his audience. Yoshua Okon’s exhibition in Gallery 1 may confound the viewer to begin with. I attended the opening gala preview and didn’t get it the first time round. Octopus presents a baffling series of scenes from the car park of a DIY store in the United States. There are four screens in the room and the projection keeps shifting form one screen to the other or has several on simultaneously. One is never quite sure what is happening and, indeed, how to react which is precisely the point. Two teams of South Americans seem to be acting out some kind of battle game in the car park as if they were two gangs of kids engrossed in imaginative play which we are not party to. From time to time, a few customers of the store wander back to their cars or into the store without paying attention to them. I came out of the first viewing perplexed and feeling almost defrauded. Was this art or some pretentious modernist hoax? The excellent artist’s talk with Yoshua Okon the following day made a great deal more sense fortunately. Yoshua is combining several formats. One is installation art, another is documentary and yet another is improvisation, what the festival brochure calls “near-sociological experiments”. Some examples shown during the talk illustrated these themes. One series of short films dates back to 1999 when Yoshua went in search of policemen in uniforms to film them performing in front of a camera for which they were given complete freedom to express themselves by acting out role plays which reflected their own inner fantasies about their power and status as policemen. Inevitably, there was outrage at this artistic performance but it shows exactly what Okon is trying to do with his art - provoke a response that is visceral and surges from within and is also humorous. To get the joke, to understand any kind of humour, of course, one has to perceive the collision of two conceptual frameworks producing an absurd result as they do in this example. To return to Octopus, one needs some background information to make sense of the installation and then the humour starts to emerge. The actors in this scene are Guatemalans and they are re-enacting their civil war which lasted a mere 36 years. Again, I include some critical details form the artist’s website: “The title makes reference to the nickname used in Guatemala for The United Fruit Company, UFCO (nowdays Chiquita Banana), a US Company based in Guatemala and directly linked to the CIA led coup and to the following civil war. At the time, UFCO was by far Guatemala’s largest land owner with tax exempt export privileges since 1901 and control of 10% of Guatemala’s economy through a monopoly of its ports and exclusive rights on the nations railroad and telegraph systems. It also helps to know that all the participants in the video are Mayan in ethnic origin and they fought on both sides of the civil war, some of them coming from the same town or village and some of them indeed swapping sides during the conflict. They meet every day at the DIY store to look for casual work as illegal immigrants. Once facts like these are understood, one is faced with stark truths and layers of irony. The exploitation depicted by the re-enactment of the Civil War (itself a parody of societies which recreate famous battles and conflicts and there is one dedicated to the re-creation of the American Civil War) mirrors the actual exploitation of the Mayans in a foreign country as well as being a second dislocation - the indigenous population forced to fight in a war not of their making and now fighting for work in another land. Now the absurdity of this staged improvisation becomes apparent in its humorous complexity. Okon’s work borders on the satirical without crossing the line as it forces us to face the contradictions within our societies and attitudes, particularly addressing the fault lines in our morality and politics-the USA is just as split between Republicans and Democrats as was the Guatemalan Civil War between its warring factions or the Israelis for and against the withdrawal from Gaza. The Viva Festival is now in full flow. Octopus continues until April 1st. 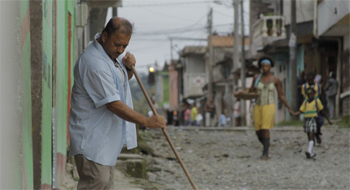 “Las Buenas Hierbas” is shown again on Saturday, 23rd March at 13.30 and is well worth watching.